There’s something about summer and berries that goes hand in hand. Blueberries, raspberries, blackberries, strawberries, im addicted! I love the “quintessential” look to tartlets. They are so easy to make and the reward is HUGE! Tarlets can make any amateur chef feel like a professional! 1. 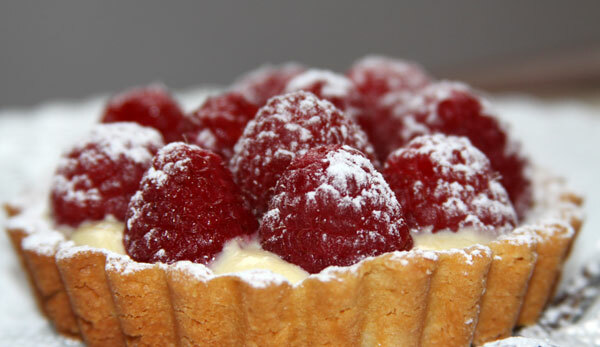 For sweet shortcrust pastry, combine flour and icing sugar in food processor, process to combine. Add butter and process to fine crumbly texture. Add eggs and process until pastry comes together. Knead lightly on floured surface until base is smooth, pat the top to flatten slightly then wrap in baking paper and refrigerate 20 minutes or until firm enough to roll out. 2. Preheat oven to 200°C (180°C fan forced). 3. Roll out dough on a lightly floured work surface, use pastry to line base and sides of 6-9 medium sized tartlet pans (I use the ones with removable bottoms) OR you can use a 3cm deep, 24cm loose-based tart tin. Trim off any excess pastry, prick the base all over with a fork, then refrigerate for 10 minutes. 4. Place sheet of baking paper over the pastry and three-quarters fill with raw rice or beans. Bake blind for 15 minutes or until edges are light golden. Remove paper and rice and bake further 10 minutes or until base is dry and pastry golden. Set aside to cool in tins. Transfer pastry cases to serving platter. 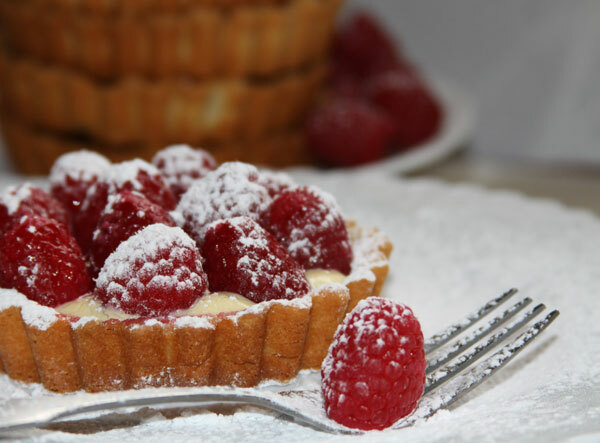 Creme patissiere is the smooth custard filling for fruit tarts. It is quite easy to make and you should get a really smooth custard with this method. I really like to play around and for an added touch of “exoticness” sometimes I use half milk, half coconut milk to add a zing! • 1 1/4 cups milk (full cream) – feel free to play with coconut milk too! 1. Gradually beat in the flour with just one tablespoon of the milk. 2. Place the rest of the milk in a heavy bottomed saucepan, Cut Vanilla Pod in half and scrape out seeds. Bring this infusion to boil and remove Pod. 4. Return the mixture to the saucepan and place back on the heat. Continue to whisk until boiling (just a few seconds ) then remove from heat and continue whisking and cooking for 2 – 3 minutes. Pour into a dish and keep in a refrigerator until you are ready to fill your pastry shells.